How do I choose the Best Acquisition Services? In two words – very carefully! 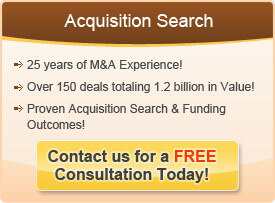 Acquisition Services are the key ingredient in determining the success of a Merger & Acquisition process. Acquisition service providers are on the front lines. They are first point of contact with potential merger partners and are building relationships with brokers who are selling companies. If they present your company well and know how to interact with the seller, you will be considered a desirable acquirer. Acquisition Services are a function of expertise and professionalism. If a firm has been in the M&A industry for many years, chances are they know how to position their clients and how to have intelligent, probing conversations. If a firm is new, they are less likely to know how to do this. Quality acquisition service providers do several important things – they generate acquisition opportunities, they qualify those opportunities and they communicate M&A credibility to the prospect. With expert communication, a company can be perceived as a highly sophisticated and experienced acquirer. Your acquisition service provider needs to be able to assess the competitiveness of a given deal. The acquisition world is a game of low probabilities so you need to have a lot of balls in the air. Having a highly experienced acquisition service provider can pay huge dividends for your company. Often this comes in form of heavy deal flow and attractively priced acquisitions.